I am, without question, a gamer. Just about every evening, I kick back with my PS3 and play. This has completely taken the place of watching television. I'm not particularly into sports, and while I can enjoy a good football game or a rousing match of futbol, it's not something I make time for. I have no patience for reality TV, and most scripted drama is too formulaic to hold my attention. There are some great shows out there, stuff that's well written and worth watching, but I tend to approach those things as I would a movie...meaning I stream them, and watch them with my wife and/or kids. If I'm left to my own devices, I just don't watch. I prefer to game. Gaming is more interactive, more engaging, and if you get the right game, it's just as well acted and scripted. For gamers, things get interesting tomorrow, because the Supreme Court is taking up a California law that bans the sale of violent video games to minors. Specifically, they ban sales to minors of any game that involves, and here I quote: "...killing, maiming, dismembering, or sexually assaulting an image of a human being." As a parent and a pastor, I understand the impetus behind this law. Gaming is...well...it's not what it was when I started gaming as a kid. I'm a regular player of Battlefield Bad Company Two, for instance. I checked my stats recently, and found that I'd sent about 1,600 other players to meet their virtual maker. It's a pretty intense game. But I don't let my kids play it. Not because it's violent, mind you. They are, after all, boys. But they understand the difference between simulated combat and real combat. It's not that great a moral leap. As my big guy puts it, "I'd never want to go to war. There's no respawn, and you have to watch your friends really get hurt and die." Instead, I limit their access because the vocabulary of the game is...well...appropriate to a war zone. And I don't really want that sort of language in my house. There are other games, like Grand Theft Auto or the brutally ultraviolent and hypersexualized Bayonetta, that I simply will not let in my house. They may be well put together, but they go beyond just paintball-esque war games into a darker place. Some inputs are to be avoided. I won't play those games. They're not good for ya. Kids should not play those games...but they're already rated M, and not sold to minors. I'm pretty intentional about placing boundaries around what my boys are allowed to play. And watch. It's called being a parent. In terms of blocking access to games that involve "..killing..an image of a human being.." I think California has overreached. The metric they're laying out doesn't just apply to some of the more extreme games out there. It goes far beyond that. Simulated combat is a central component of gaming. Pretty much every Teen-rated Star Wars game, which are remarkably popular with boys, would need to be restricted. As would many button-mashing fight games. 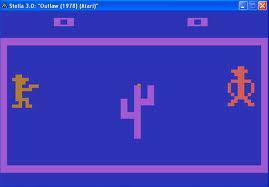 As would Outlaw for the Atari 2600, which is presented in all its brutal gun-blazing glory above. It is killing, after all. This functionally removes California from the gaming marketplace. I can't see how that definition provides a meaningful metric for what is and is not an acceptable game for kids. If you're playing a game like Lego Batman, or Lego Indiana Jones, do you "kill" an image of a human being? It's a Lego Minifigure, sure, but it looks like a human being. What about games like, say, Dummy Never Fails, a physics game in which you hurl mannequins into objects? That's definitely human-looking. I'm not sure how California is going to regulate sales. The gaming industry is rapidly moving from distributing games through physical media to distributing games via download. Is California going to block access to gaming downloads over XBox Live or the PlayStation Network? Or to downloads of games over iTunes? My boys often get gift cards that allow them to access those games...if they did so directly in California, would that constitute a violation of this law? Another often ignored but growing area of the gaming industry is free online flash gaming. Through sites like miniclip or Candystand, you can play an amazing array of games that are paid for by ad placement. Many of those games are superior to the console games of 10 years ago, and many contain simulated combat. Unless California is prepared to become China, and to block access to large swaths of the internet, I just can't see how this law will be meaningful. This seems, quite frankly, like one of those "what about the children" laws. They're impossible to meaningfully enforce, and only serve to make Californian legislators feel better about themselves. It's not just that it seems to fail the First Amendment test. It's that the law seems painfully overwrought and fundamentally unrealistic. California needs to just pass Prop 19 and, like, chill, dude.